PNRD Assam Recruitment 2018 : Hello Dear Assam Career Job Aspirants. How you all doing ? We are here to inform you about a new Recruitment in Department of Panchayat & Rural Development ,Assam. Yes !! 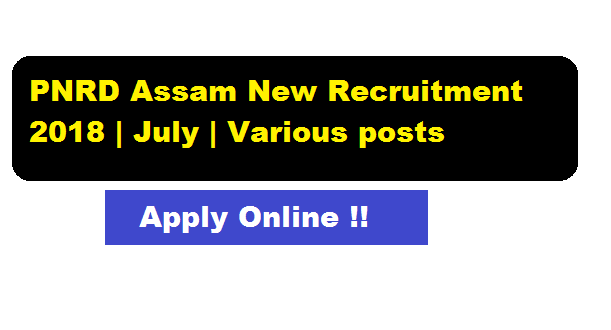 According to a latest PNRD Assam Recruitment 2018 July notification advertisement , Applications are invited from eligible Indian Citizens in online application published in official PNRD Assam website , for filling up various positions on contractual basis under Shyama Prashad Mukkherjee Rurban Mission Under Department of Panchayat & Rural Development ,Assam. The details of the PNRD Assam Advertisement for Jobs can be found below. In this section, we will be mentioning details about the Recruitment of various vacancies Under PNRD Assam Recruitment 2018 with all the important requirement criteria to apply for the posts. Eligibility Criteria : Candidates must be Post Graduate in Rural Development, Rural Management or equivalent with minimum 60% in qualifying exam from a reputed organization, with atleast 3 years experience in Industry or Government sector or similar sector. Eligibility Criteria : Candidates must be Post Graduate in GIS related field, with minimum of 50% in qualifying exam from a reputed organization, with atleast 2 years of GIS implementation experience. Eligibility Criteria : Candidates must be Graduate with minimum 50% in qualifying exam, with atleast 1 year similar experience in Industry or Government sector. Computer Knowledge is mandatory. Eligibility Criteria : Candidates must be Post Graduate with minimum 50% in qualifying exam from a reputed organization, with at least 2 years experience in Government sector or similar sector. Experience in GIS is preferable. Interested and Eligible candidates can apply the above mentioned various jobs in PNRD Assam through ONLINE mode only. The last date of Submission of Online application is on 16th July 2018 midnight. 1/ Any incomplete and invalid documents may lead to rejection of the candidature. 2/ The selected candidates under PNRD Assam Recruitment can be posted in various districts as per as the requirements of Assam PNRD Department.